The future of our planet belongs to the youth, who will continue to push veganism forward. What better way to welcome the new year, with all of its hope and promise, than to share delicious recipes by an ambassador from the new vegan generation – 17 year old LAIKA reader and cooking aficionado, Franny Gould. “We can communicate our ideas through vegan cuisine,” says Franny. “While many students in my high school bake for their peers and teachers, my baked goods never fail to spur a discussion about the merits of veganism.” Here she shares two original celebratory creations, which she also photographed, followed by a heartfelt essay. Preheat oven to 350°F. In a large bowl, combine vegan butter with sugar. Add in in nondairy milk, vanilla extract, salt, baking powder, and baking soda. Combine until smooth and let the mixture sit for a couple of minutes. Set aside the flour and the kombucha in two different bowls. After the mixture is set, add a little bit of the flour to the mixture and stir. Then add a little bit of the kombucha and stir. Repeat this until all the flour and kombucha are in the mixture. Add orange juice to the mixture and mix until smooth. Then add zest and stir. Insert cupcake liners into cupcake tins and pour mixture into 1⁄2 to 3⁄4 of each tin. Bake for about 25 minutes (or until cupcake top is golden brown). Let cool before adding the frosting. Beat butter until smooth. Then add 1 cup of powdered sugar and beat until completely smooth. Mix in vanilla and 1 tbsp of whichever kombucha you choose to use. In increments, mix in the remaining 3 cups of powdered sugar. Add zest. Once the mixture has a thick consistency and is frosting-­like, either scrape into an icing bag or spread directly on cupcakes. 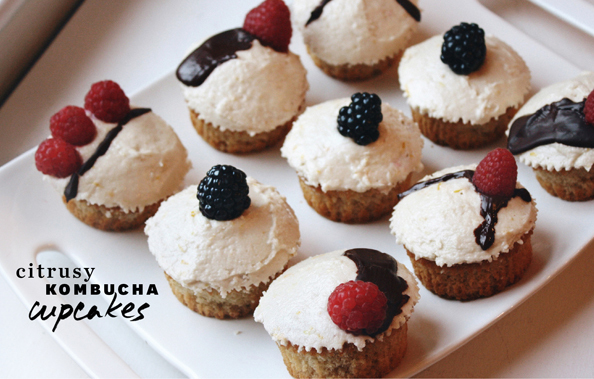 Decorate cupcakes as desired (I used chocolate drizzle, raspberries, and blackberries). Optional chocolate garnish: ­ melt chocolate and drizzle onto frosted cupcakes. Using a skillet, simmer tofu triangles in EVOO and Sriracha. In another skillet, sauté cauliflower in EVOO. 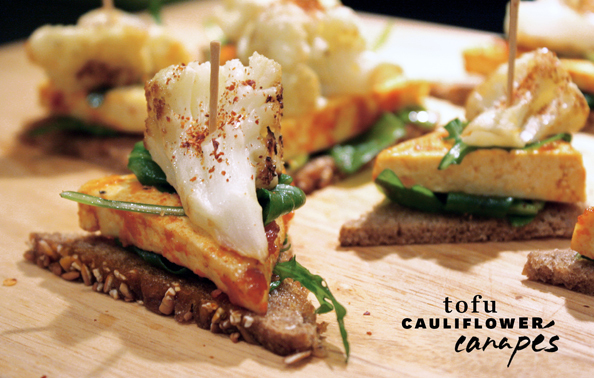 To construct the canapé, start with the toast, then place on a couple of leaves of arugula, then the Sriracha tofu triangles, followed by more leaves of arugula, and finally the cauliflower. Sprinkle with crushed red pepper flakes. Secure with a toothpick or sandwich pick. I used to think I wasn’t good enough to be an activist. I thought that political, economic, and social change could only be accomplished by those with some level of fame, some degree of importance. I thought that as a young, idealistic vegan, I should be seen and not heard. In the fall of 2014, I participated in the People’s Climate March in Manhattan. Although already a vegan, I wasn’t yet doing much advocacy on behalf of the vegan community. Somewhere along the march, I saw a sign that read “Raising Animals for Meat causes 51% of greenhouse gas emissions, cuts down more than 14,000 acres of rainforests everyday, uses more than 11 times more fossil fuels than producing plant protein. Save Earth, try vegan.” This information was not news to me, but I still did a double-take at the display. The girl holding the sign was no more than 7 or 8 years old. She was standing on the sidewalk, facing the procession of marchers. There was something about her face, the way she stared straight into my eyes. Her message was a kind of powerful that I had never experienced before. 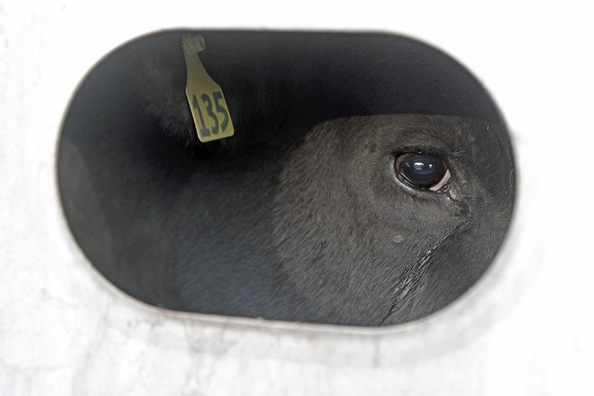 It combined her vulnerability — a plea for the protection of her generation’s future — with her determination to convert at least a few marchers to veganism. She may have not been prominent in her stature. But she was an activist. When it comes to fighting for social justice, I may not have as big of a voice as a celebrity. But I do have a voice. And by simply keeping the conversation alive, I am an activist. From the Editor: Do you have a vegan story to tell and love making things? Write us at editor@laikamagazine.com and you may be featured in our Reader Spotlight on the LAIKA site! At the COP21 Climate Change Conference that took place in Paris from November 30 through December 12, the most prominent objective was to reach “a new international agreement on climate change, applicable to all, to keep global warming below 2°C.” Last year’s report by Chatham House, a London-based independent policy institute, stated that “consumption of meat and dairy produce is a major driver of climate change” and that it would be extremely difficult to keep global warming under 2 degrees Celsius without a dramatic shift in dairy and meat consumption. The Climate Deal was finally signed on Saturday, yet it contained glaring omissions. While 195 countries pledged to pursue “efforts to limit the temperature increase to 1.5 degrees Celsius” and gradually reduce emissions of the heat-trapping gases that are warming the planet, no acknowledgement was made of animal agriculture being responsible for over half of those emissions. The deal called for the preservation of forests, but ignored the fact that over 80 percent of deforestation in the Amazon and about 14 percent of the world’s total annual deforestation is the result of cattle ranching. Search the document‘s 31 pages and you won’t find any presence of words like “meat,” “methane,” “animals” or any mention of human eating habits. Life as we know it depends on the world limiting temperature rise to 2 degrees Celsius (3.6 degrees F). According to reports from the National Research Council and the World Bank, should temperatures exceed those levels, the results could be catastrophic. Potable water would become much more scarce. Many of the world’s plants and animals would be on the brink of extinction. The Arctic would continue melting, losing 30% of its annual average sea ice. Saltwater intrusion from rising seas would make some island nations uninhabitable, with others going underwater entirely. 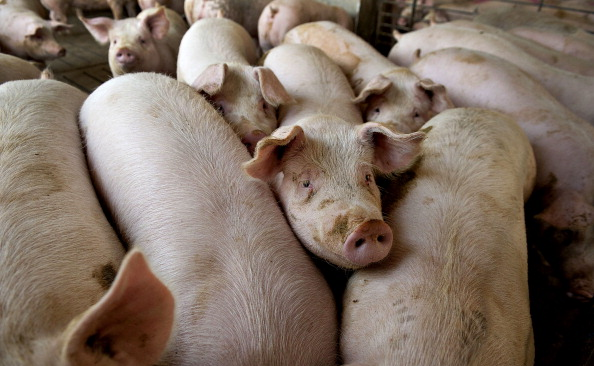 The omission of animal agriculture at the Paris conference is particularly alarming considering that last April became the first month in recorded history where the global concentration of carbon dioxide in the atmosphere reached 400 parts per million (ppm). “The world is quickening the rate of accumulation of CO2, and has shown no signs of slowing this down. It should be a psychological tripwire for everyone,” said NASA’s global change and energy program manager Dr. Michael Gunson in a statement. CO2 emissions — a form of greenhouse gas — are the primary accelerator of climate change. A greenhouse gas (or GHG for short) is any gas in the atmosphere which absorbs and re-emits heat, keeping the planet’s atmosphere warmer than it otherwise would be. The United States has the highest meat consumption per capita in the world. The effect of billions of animals used in farming on producing greenhouse gasses exceeds all emissions from transportation, including airplanes. 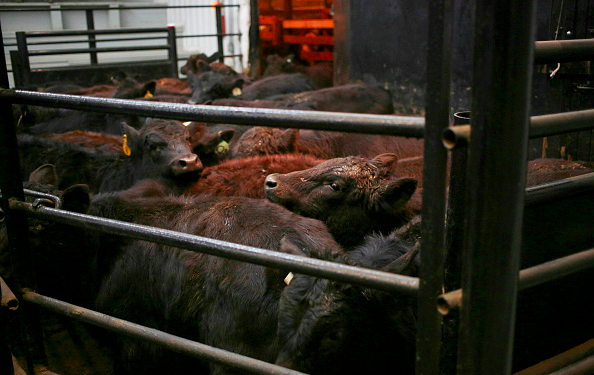 Cattle production, for example, requires a great deal of land, which leads to the destruction of forests. The trees that are burned to clear the land release carbon dioxide into the atmosphere. The cows produce methane, a potent greenhouse gas that causes warming. Enormous amounts of fossil fuel are used in animal agriculture, generated by everything from the production of feeds, to the transport of animals to slaughter, then processing them into meat products and transporting those by land, sea and air. Livestock is responsible for 65% of all human-related emissions of nitrous oxide. Taxpayers unwittingly fund this destruction. The US government collects $38 billion annually in taxpayer money to subsidize the meat and dairy industries. (By contrast, fruits and vegetables get only $17 million). A 2013 report by the Environmental Working Group (EWG) showed that beef production generates 13 times the emissions of vegetable protein such as lentils and tofu, and that 20% of of the meat that is produced gets thrown away — massive amounts of carbon dioxide are generated for nothing. Furthermore, the Climactic Change journal detailed in its 2014 study that high meat eaters are responsible for over 16 pounds of carbon dioxide pollution per day, in comparison with only 6.5 pounds in vegans. Yet, vegan meals were hard to come by at the Le Bourget Centre, where the Paris conference took place. This, in spite of the secretary general of the conference Pierre-Henri Guignard vowing to keep the conference’s carbon footprint at a minimum (estimates put it at 21,000 tons of carbon dioxide equivalent, or CO2e) and the summit’s site featuring an extensive array of emission-reducing measures — none of them involving earth-friendly dining options. This year, California experienced its worst drought on record. What has the largest water footprint of all the food produced in that state? Animal feed. 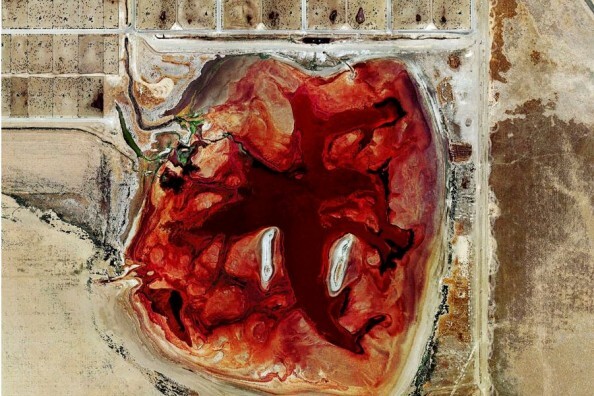 In the US, half of all water usage goes towards producing 41 million tons of plant protein that is then fed to animals who are then killed to produce only 7 million tons of meat. Newly-released NASA satellite data showed that the world’s largest underground aquifers – a source of fresh water for hundreds of millions of people — are being depleted at alarming rates. California’s Gov. Jerry Brown, who was in attendance at the Paris climate summit along with a large delegation, focused on the potential for climate catastrophe and made sweeping recommendations for how to address the problem. He left out any mention of the devastating impact of meat on climate change. 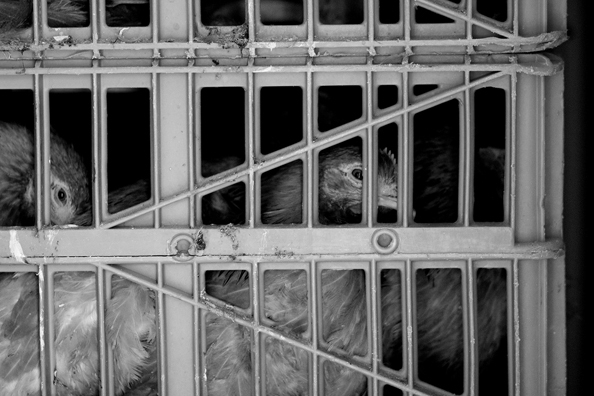 Chickens awaiting slaughter (Mike Hrinewski/ LAIKA). A vegan lifestyle has now been proven as one of the most powerfully effective solutions to curtailing climate change. With the world’s leaders failing to address the crisis of animal agriculture, it is our personal responsibility to educate and empower ourselves, disseminate information to our communities and inform people about the consequences of their eating habits. Politicians deliberately hiding the truth from the public for fear of backlash will not make the problem go away. The time for change is now. Recommended viewing: Cowspiracy, Racing Extinction, Earthlings, Virunga. For an in-depth coverage of vegan living, read or subscribe to LAIKA, printed in limited runs on recycled paper with vegetable-based inks and available in digital format.